On the eve of his meeting with the Emir of Qatar, Tamim bin Hamad Al-Thani, and President of the Palestinian Authority, Mahmoud Abbas, in Doha, Khaled Meshaal gave this extensive interview to Anadolu Agency. He also denied Israel’s claims regarding Hamas’s plans to stage a coup against the Palestinian Authority and considered the statements made by the Palestinian Prime Minister Rami Al-Hamdallah in regards to hitting Hamas’s infrastructure to be “exaggerated”, pointing out that the movement’s military losses are “limited”. The Hamas official described the Israeli Prime Minister Benjamin Netanyahu as a “child killer”, considering Israel’s actions in Gaza since the beginning of its attack on Gaza on July 7th to be a real “Holocaust”. 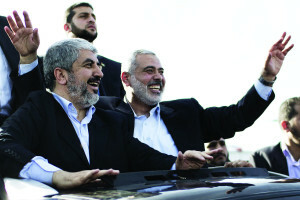 Meshaal noted that his upcoming meeting with President Mahmoud Abbas will focus on enhancing the path to reconciliation and national unity, as well as coordinating the means by which Palestinians can face their national issues with a coordinated and unified position based on the national partnership that the reconciliation process was founded on. During a press conference, Netanyahu described Hamas as “ISIS” and said that he destroyed the tunnels and hit Hamas’s infrastructure. What are your comments on his statements? The child-killer in Gaza, Jerusalem, the West Bank and many other areas in the world, does not have the right to label others. What Israel has been doing for the last 45 days is a true Holocaust committed in Gaza, including killing children, destroying residential areas, mosques, UNRWA schools and hospitals. This has resulted in 10,000 wounded and 2,000 martyrs, a quarter of whom are children and another quarter of whom are women and elderly. This enemy is reproducing a terrible replica of Hitler’s actions of decades ago. Today, we are witnessing true Nazism and Netanyahu is trying to ride on the wave of the war on terrorism in an attempt to find common ground with the American agenda. However, the Zionist enemy’s cards are out in the open for the international community to see, and they are losing more and more by the day, so they are trying to limit their losses. As for the destruction of Hamas’s tunnels and infrastructure, every war results in losses, and I admit responsibly that we have sustained losses and made big sacrifices, but he (Netanyahu) is exaggerating his achievements; he has achieved nothing. The only thing he achieved was killing children, destroying homes and committing Holocaust massacres against Gaza. In terms of military losses, yes we have had some losses, but they are limited, as stated by Al-Qassam Brigades [Hamas’s military wing] and the resistance, including its military wings, are capable of facing the Israeli aggression and they will win the battle. On the subject of the battle, Al-Qassam Brigades announced yesterday that they will not return to negotiations. What do you mean by this? This is a hostile war on Gaza and we are concerned with stopping this hostility by defending ourselves. After putting an end to this hostility, we are concerned with meeting the demands of the Palestinian people, beginning with lifting the blockade imposed on Gaza, releasing the prisoners and all the other demands presented by the resistance. Our demands are that the attacks end, the siege is lifted and for the demands of the Palestinians to be met; our cause is one and we will fight for it in the military and political arena in a manner that serves the Palestinian people. How wiling are you to resume indirect negotiations with Israel through Egyptian mediation? Dialogue to reach an agreement through indirect negotiations is a means, not a goal; it is no fun and it is not something we wish to achieve. As long as the conditions conducive to achieving the Palestinian demands are unavailable, then dialogue is pointless, regardless of the place or mediator. The point is that we must be sure that there are serious conditions that drive the enemy to give in to the Palestinian demands. How can you be sure that these conditions are available? Managing battles is a combination between field work and political action, and we know when there is a point in negotiating. We, as a political leadership, decide when taking a step in the right direction is worthwhile, and this is connected to the situation in the field. While we are on the topic of the situation on the ground, Israel accused Hamas of violating the ceasefire before it ended last Tuesday. How true is Israel’s story regarding your violation of the ceasefire? The Zionist enemy made two mistakes. First, it led the negotiations, through Egyptian mediators, to a dead-end and aborted all political efforts to reach an agreement, and therefore it must bear the responsibility for its actions. The second mistake is that it violated the ceasefire hours before it ended and lied, once again, to the international community and American administration (just as it had previously deluded them and broke the ceasefire, using the story of the missing soldier) when the government claimed that it was responding to rockets fired from Gaza, but this was a false excuse. Israel was planning an attack on Gaza during the ceasefire, planning to execute it before the ceasefire ended, believing that it would be able to kill some officials, which was proven yesterday when it tried to assassinate the Commander of Ezzedine Al-Qassam Brigades, Mohammed Deif, but failed. The only thing achieved by the enemy was the murder of Deif’s wife and son Ali. The Zionist enemy isn’t only content with committing the crime, but makes it worse by lying day after day about it. How true was the talk regarding being close to reaching an agreement right before the ceasefire was broken? In political negotiations, there is ebb and flow and getting close and going far; negotiation tactics are known in this regard. However, over the past two weeks, the enemy has used manoeuvres, evasion, pressure and blackmail, trying to deprive Gaza and the Palestinian resistance from reaping the fruits of their resilience and the enemy’s military failure because the Israeli leadership is suffering from an internal crisis as a result of its failure in the field, and now it wants to make up for two things. First, to pretend it was successful in the field, whether with the story of destroying tunnels or infrastructure in Gaza and exaggeration in this regard; and second to prevent the Palestinian resistance from rewarding its steadfastness with glorifying political gains, most importantly the lifting of the siege. However, these are all weak and failed attempts, and just as the resistance remained steadfast on the ground, it will remain so in the political arena and we will not back down from our specific demands which have been agreed upon by the Palestinian people, beginning with lifting the blockade imposed on Gaza. Our message to the world is that the time has come to address the root of the problem by ending the occupation and settlements and enabling the Palestinian people to live in peace, without any settlements, and to achieve self-determination and to live in a country away from this occupation, which remains as the last occupation in the world. Based on Egypt’s sponsorship of the negotiations, is there an improvement in relations between Hamas and Cairo? It is too early to judge this. Just as we have previously stated, we do not interfere in internal Egyptian affairs, nor in any other Islamic, Arab or international affairs. Despite our rejection of the Egyptian ceasefire initiative, we do not object to the role of the Egyptians and coordinating with them, and we are keen on keeping good relations with the Arab nation for the benefit of the battle in Palestine. Speaking of relations with Egypt, was opening the Rafah crossing proposed on the negotiations agenda? The Rafah crossing was not proposed in the agenda of the negotiations with the Israelis because this is an Egyptian-Palestinian issue that we have addressed amongst ourselves and the Egyptians. This is only natural because the Rafah crossing must be opened and we are not calling for chaos; we are merely calling for the crossing to be open like any other crossing between two countries, not because Gaza is isolated from the West Bank or that it has a special case in itself. This is a crossing between the Palestinians and Egyptians and we call for the crossing to be open just as all the crossings between neighbouring countries usually are. Was the disarming of the resistance also on the negotiations agenda? The enemy demanded that this be on the agenda, but we rejected it. However, the enemy is seeking to do this, and we will continue to refuse it and will not accept for it to be on the agenda. You are expected to attend a meeting with the PA President Mahmoud Abbas and the Emir of Qatar. What are the most prominent issues to be discussed during this meeting? We are in a state of Palestinian reconciliation and a state of unified Palestinian positions and this has been highlighted during this war. We are keen on deepening this situation and enhancing the path towards reconciliation and national unity, as well as coordinating on how to address our national issues with a unified position based on the national partnership on which the reconciliation process was founded. While we are on the topic of the national partnership, Israel announced last Monday that it arrested a cell consisting of 93 Hamas activists in the West Bank who “planned to stage a coup against the PA”; what is your comment on this? This is an attempt to cause chaos and is a lie. There has not been a cell of 93 people in the history of Palestine; the military cells usually consist of small groups of people. This was basically a roundup of detainees over the past 9 months, give or take, and it was an attempt to promote a false narrative and incite the West Bank. The enemy is fighting our people and torturing them in Gaza and is now attempting to sabotage Palestinian reconciliation, sometimes saying this group wants to carry out operations against the occupation and sometimes saying it wants to stage a coup against the PA. This is a false and dysfunctional narrative and the Palestinian consciousness will not fall victim to it. We have one battle and it is against the Israeli occupation; within the Palestinian ranks, despite our differences, we work through dialogue, communication and political means, and nothing else. Israeli Prime Minister Benjamin Netanyahu said that “the Arab world is against Hamas”, and that only Qatar, Turkey and Iran are on the movement’s side. Those who have followed our current defensive operation have realised the large support received by Hamas, the Palestinian resistance movements and its brigades on an Arab, Islamic and international level. We do not deny that some governments and regimes (which will remain nameless) are not on our side, but all the people and nations are with us, as well as many governments, leaderships and officials, some publically while others in secret. However, those who side with Netanyahu and the Zionist enemy are very few and what do we want with them? We do not care as long as the [Arab] nation is with us and is proud and happy with the achievements of the resistance. Those who want to side with others, may God forgive them, but they are the isolated ones, not the Palestinian resistance. What is your assessment of the Turkish position on the Palestinian issue? Turkey’s position has always been distinguished both at the official and popular level. It has made generous initiatives and they are much appreciated by the Palestinian, Arab and Muslim people and we will never forget the nine martyrs of the Mavi Marmara. Turkey has left its mark by means of its leaders, people, responsibilities, various commissions and media, and we appreciate this greatly. In the last war, and despite the Turkish leadership’s distraction and preoccupation with elections, it was present with its political, moral and popular support and sent aid throughout the war, especially during the humanitarian ceasefires. Throughout, I have remained in contact with Prime Minister Recep Tayyip Erdogan (and I would like to congratulate him on his victory in the presidential elections); and with Dr Ahmet Davutoglu, the Turkish Foreign Minister; we communicated and coordinated. Therefore, we are grateful for the Turkish position and we thank the Turkish people and the Turkish leadership. Indeed, I salute the Turkish people and express my appreciation to them. The people of Palestine have not forgotten the people of Turkey and its leadership, and we express our gratitude and appreciation towards them. I say to them and to all the nations that supported us that the reward from Allah to those who assisted the people of Gaza and supported Palestine and the resistance will not be lost. What about your relations with Qatar, which Israel always accuses of supporting terrorism due to its position on the resistance? The relationship between Qatar and Hamas is not new and is out in the open. Hamas has a wide network of relations with Arab, Islamic and international parties, and this is an issue no one is ashamed of. We appreciate greatly the official and popular Qatari position as well as the courage of the Qatari leadership and all that it has given to the Palestinian issue. Qatar’s support is not limited to Hamas as a movement, but is extended to the Palestinian people. Former Emir Hamad bin Khalifa Al-Thani and current Emir Tamim bin Hamad bin Khalifa have had supportive positions and have visited Gaza, as well as played a key role in reconstructing Gaza. They have also had supportive political positions advocating for the rights of the Palestinians and have sponsored many meetings in Doha between the Palestinian forces, between Hamas and President Abbas, and the first Gaza Summit during the 2008-2009 war. All of this is a source of pride and honour for Qatar and it should be thanked, not blamed. However, for the enemy to attack Qatar is a source of pride for the country and proof that it has adopted the correct positions. As for Iran, are you still receiving support and rockets from them? In the past, Iran has supported us financially and militarily, and this is a well-known fact. However, in the past few years, we have reached a different phase of the relationship; we have not cut off relations, but it has changed. In light of this extraordinary situation, the Palestinian resistance looked into means of arming itself, and they mostly relied on production in Gaza and on coming up with creative military tactics, and this stunned the world. Some view Hamas’s position regarding the situation in Syria as confused; why is that? We do not interfere in Syrian affairs, but a separation occurred over the Syrian crisis. We do not interfere in the affairs of others, and everyone knows we are on the side of the people in terms of moral, principle and political values, but we do not interfere in any crisis, neither in Egypt, Syria nor Iraq. We are always supportive of the people and their freedom and dignity because these are our morals and principles. As an option for a solution, would you accept the presence of international observer forces, such as the UNIFIL forces in Lebanon? International forces only work in conflicts between independent states, but not when a nation lives like the Palestinian nation, under occupation. The party that needs an international force to rein in its aggression and put an end to its occupation and settlement is the Zionist enemy. As for the Palestinian people in the West Bank and Gaza, they need the support and advocacy of the international community, not its restraint. The Palestinians look forward to the international community’s support and backing and for it to stop the murdering, thieving Zionist enemy. How true is the story of Hamas calling for the intervention of Hezbollah and how willing are you to coordinate with the group in the future? This is not true at all; we have not asked them for anything. This is not the first war we have been engaged in to defend ourselves against Israeli aggression. This is the third war on Gaza in less than six years, and we depend on Allah, and then on ourselves, and we are well aware of the nation’s conditions; each nation has its own situation to deal with. As for communicating with active countries and forces in the [Arab] nation, there are aspects we agree on and others we differ in with all forces, and Hezbollah is no exception. So, in light of the latest developments, how prepared is Hamas for a long-term war? Our strategy is not to engage in wars, as wars occur between states. We are a resistance movement, but the enemy is waging forms of war that usually occur between states, as it is using aircraft, artillery, naval forces, enriched uranium and the brutal arsenal it possesses. All we can do is defend ourselves, but the surprise was that with their modest capabilities, the Palestinian people were able to last on the battlefield during the wars imposed on them, just as they lasted in the resistance arena. We have prepared ourselves for battles of resistance against the occupier, but if wars are imposed on us, then we will defend ourselves. The more accurate expression is that we are fighting battles of resistance and national liberation because we are a people under occupation. In terms of our preparedness for a long-term war, this can be measured by Palestinian history, as the Palestinian people have been preparing themselves for 100 years to fight until the end in defence of themselves and their land, and those who have been fighting for 100 years will not be worn out by a month, a year, or even years. How do you view the situation in the region after the shifts witnessed today? The situation of the Arab and Islamic world in general is moving like quicksand. There is a state of difficult and tough labour, and there are shifts, progress, regression, ebb and flow, and this is the nature of strategic shifts in any nation. The Arab and Islamic world is searching for itself and is trying to draw a path and form a promising future for itself, but there are internal and external hindrances. Such difficult and painful internal interactions cause chaos but, ultimately, the train of strategic transformation will not stop in the region. We hope this will occur peacefully and safely, far from bloodshed, and that the Palestinian cause remains the cornerstone in the nation’s transformations. Do you believe that the Palestinian cause is still an Arab priority? I do not doubt that in the collective conscience of the Arab and Islamic world, the Palestinian cause is and will remain a priority. The Arab preoccupation with internal affairs is their right, but I do not believe that this allows them to dismiss their top cause. The proof of this is that every time the Palestinian cause heats up in Gaza by the actions of the resistance, in the West Bank in the face of settlements, or in Jerusalem in confrontation of the Judaisation process, the Arabs forget their local and internal issues and become occupied with the issues of the Palestinians, or at the very least, show their true emotions. If a few elites in the world of politics and media are unbalanced and have the wrong attitude, then this is only a limited section of the nation that does not represent or express the collective mindset and conscience of the Arab and Muslim world. During the last war, we saw how the Arab nation interacted proudly and honourably and supported the Palestinian resistance in an unprecedented manner. How would you judge the official Arab position on the aggression against Gaza? The official Arab position is certainly varied. There are those who supported the Palestinian people and the resistance openly and those who remained silent; and there are those who were content with doing the bare minimum while others provided great support; there are also those who disappointed us and came up short. Can we end with a final message to the people of Gaza and another to the Israelis? I say to the people of Gaza that you are have a just cause, you are doing the right thing and, God-willing, you will be victorious. Gaza is the pride of the nation and the symbol of its glory, and it is now in a pioneering position, setting an inspired and impressive example. Together we will engage in the battle, and we are proud of the Gazans and the steadfastness and perseverance they have shown, especially in the ranks of the youth, who have embraced the resistance and stood as one behind it. All of this sets an example we are proud of; a balanced example of resistance against an occupier, moderate ideology, and open-minded politics that is aware of its Arab, Islamic, regional and international surroundings. To the Israelis I say that your leadership is leading you to destruction. Brutal military force won’t change history, nor will it give the occupiers a just cause or defeat those who actually have a just cause. The Palestinian people are committed to their right to their land, to defend themselves and to life the siege imposed on Gaza, and their number one demand is to eliminate the occupation and settlement. If the Israelis do not recognise this, then they are wasting time and exhausting themselves and their security, and their leaders are misleading them if they think they can break the will of a free nation like the Palestinians.